We don’t have an air conditioner in our current home, but we hope to have one in our future home. We also hope to make our future home very smart, and this is an item that would help us do so. It’s called the Sensibo Sky. This product requires a 2.4GHz WiFi network and an AC or heat pump that is able to be remotely controlled. We don’t have the type of heat pump or AC to personally do this currently, but we hope that our future home will be able to use this smart gadget. I’ll tell you what I know about this device so far. Included in the package, besides the device itself, is a plug-in that is world-wide compatible, and a USB cable. What all can this device do for you? Through the app on your phone, it can tell when you are nearing home and turn on the heat/air conditioner before you get in the door. Likewise, it can also turn everything off when the last person leaves. Of course, this means savings in energy and electricity. You can see what the temperature is in your house while you are away, create a schedule for heating and cooling, and control the A/C from anywhere. Do you have Google Home or Alexa? It is supposed to work with them and open API or IFTTT. Other reviews found in the Play Store seem to suggest that Sensibo Sky is not the easiest in the world to set up. There are tips and tricks other users have found- like placing the device immediately below the A/C. It does seem like Sensibo has good customer service to help out users having issues. A suggestion would be to go on Youtube and find videos to help out. Good reviews can be found on Amazon.com where you can purchase one of them for $119. 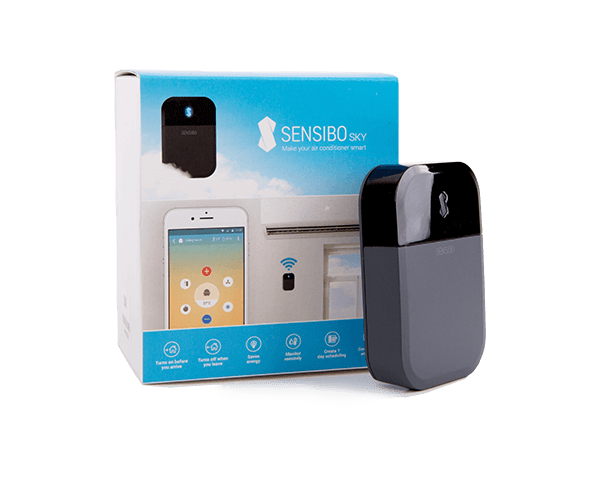 There’s also a Valentine’s Day coupon for $30 off on the Sensibo website. This most likely will not last long, so if you are reading this after Valentine’s Day, you may have missed out. Multiple devices can be purchased at a discount as well. This review is unbiased and not influenced by any compensation given by Sensibo.